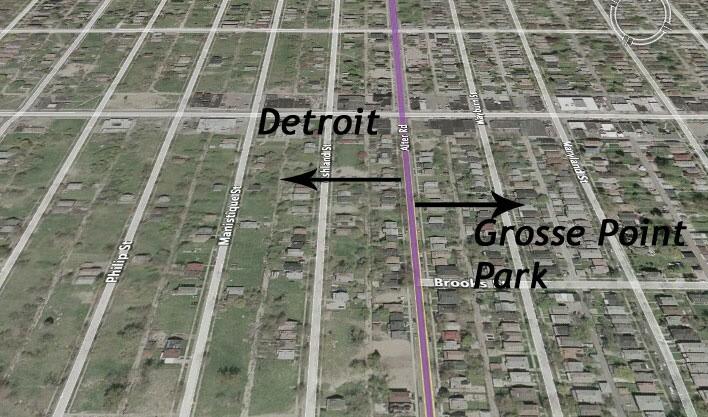 I came across this photo (yes, I see the spelling error) while doing research on Detroit vs. Grosse Pointe. It illustrates the close proximity of the Pointes to Detroit, and it’s also a good example of the abandonment and decay that has been going on in the city for decades. There are walls (actual physical barriers in the form of guard rails, fences, brick walls) separating parts of Grosse Pointe from Detroit. A horrible realization at first, but… I get it. I mean, we’re moving to Grosse Pointe and not Detroit for a reason. So what does the future hold for this broken city? It’s a question I plan to examine once I get there. I feel like I know San Francisco in such an intimate way; it’s going to be daunting being a stranger again . But as is true with almost every unknown, there’s an element of excitement, too. Looking forward to exploring and sharing my discoveries and perspectives. This entry was posted in Detroit, Grosse Pointe, Musings, Places and tagged Detroit, Grosse Pointe, Moving, Musings. Bookmark the permalink.